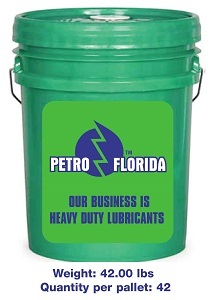 PETROFLO HEAVY DUTY DIESEL MOTOR OILS, are mixed fleet engine oils formulated to provide optimum performance in modern, low emission diesel engines operating under a wide variety of service conditions. They are blended with premium base stocks and high quality additive to achieve the following benefits: high temperature piston deposit control, foam protection, soot dispersancy and oil thickening control, oxidation inhibition, low temperature sludge protection, corrosion and rust inhibition, valve train wear protection and TBN retention. Formulated with advanced additive technology, they provide excellent control of deposits and sludge, minimizing oil consumption and optimizing engine overhaul intervals. 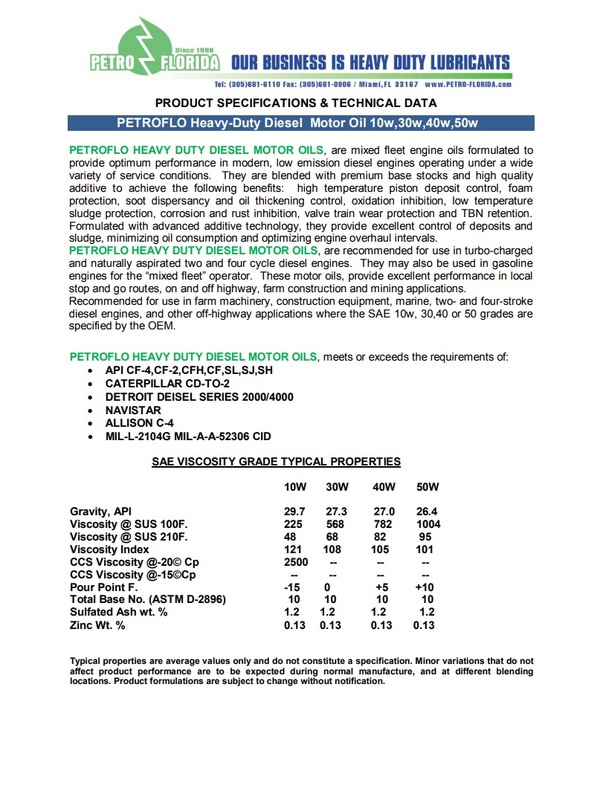 PETROFLO HEAVY DUTY DIESEL MOTOR OILS, are recommended for use in turbo-charged and naturally aspirated two and four cycle diesel engines. They may also be used in gasoline engines for the “mixed fleet” operator. These motor oils, provide excellent performance in local stop and go routes, on and off highway, farm construction and mining applications. Recommended for use in farm machinery, construction equipment, marine, two- and four-stroke diesel engines, and other off-highway applications where the SAE 10w, 30,40 or 50 grades are specified by the OEM. PETROFLO HEAVY DUTY DIESEL MOTOR OILS, are recommended for use in turbo-charged and naturally aspirated two and four cycle diesel engines. They may also be used in gasoline engines for the “mixed fleet” operator. These motor oils, provide excellent performance in local stop and go routes, on and off highway, farm construction and mining applications. Recommended for use in farm machinery, construction equipment, marine, two- and four-stroke diesel engines, and other off-highway applications where the SAE 10w, 30,40 or 50 grades are specified by the OEM.